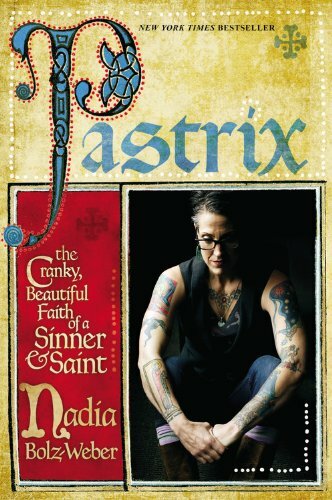 If you’re not familiar with Nadia Bolz-Weber, you ought to take a moment and Google a picture of her. Because if I just tell you she’s a Lutheran pastor and leave it at that, your mind’s eye probably wouldn’t picture the tattooed arms and black tank tops. (You can also find her on YouTube by searching “Lutheran tattoo.”) She’s not your typical preacher of the Word. It is so refreshing to read a spiritual memoir by a Christian who understands anger. So many pastors and writers in the genre try to sanitize their lives and experiences to fit the proper, neat, ideal Godly mold. Or if they’re willing to admit they’ve struggled with doubt, fear, addiction, or anything else untoward in the past, they must immediately make it clear that they are now transformed into pious disciples who wear white robes and never, ever swear. Nadia Bolz-Weber is much more honest than that. She’s quick to point out that God saved her from a life of destructive choices. However, she doesn’t pretend that she is now permanently “fixed.” She still sometimes kind of hates people. She still struggles to make room in her fledgling church for the types of people who used Christianity as a weapon against her in the past. She still makes selfish choices and screws up. And best of all, she acknowledges that she, and every single one of us, is simultaneously both a sinner and a saint, all the time. I’m not sure I can explain how revelatory that concept was for me. I love reading religious writing from unlikely sources. Anne Lamott has long been a favorite of mine, and Nadia BW reminds me of her a bit. Somehow, when people who admit they are selfish, angry, and imperfect also affirm that they are beloved children of God, my heart gets warm and believing in God feels easier. Because if God loves that hot mess of a person, God probably possibly maybe loves me too.